The members of the newly-formed Council are: Sr Philomena Burrell (Perth); Mrs Heather Carey (Adelaide); Sr Kathy Hatherall (Brisbane); Mr Richard McMahon (Sydney); Mrs Kathleen Lillis (Melbourne); Fr Brian Moloney (Australian Catholic Council for Clergy Life and Ministry Representative) and Bishops’ delegate Bp Peter Comensoli (Sydney). The Lay Pastoral Council will advise the Bishops’ delegate to develop a network of resource personnel with expertise in scripture, theology, formation, psychology, anthropology and social analysis. The Council was the vision of Bishop-Emeritus Michael Malone who saw an increasing need for support for lay people who see ministry as their vocation, whether this be in a paid or voluntary capacity. Chair of the BCCM Bishop Brian Heenan expressed his delight that the Bishops Conference saw this Council as a priority and pledged his ongoing support. 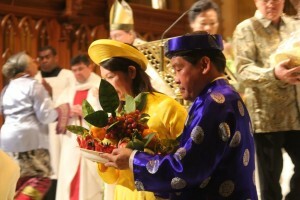 “This is a wonderful sign of how the Church in Australia is recognising the Body of Christ present in the lay faithful. It is a sign that the Bishops see the importance of supporting their formation, and that they recognise the link between this and a strong and vibrant Church in this country”, he said. Bishops’ delegate Bishop Peter Comensoli was honoured to have been chosen to work with this council. “This is the first opportunity I have had to work with a Council of the Bishops’ Conference, and I am happy that it is in such an important area of Church Ministry. “Lay people, more and more, are demonstrating through their participation their depth of faith and spirituality, and their leadership is crucial in the evangelising message of our Church”, he said. The BCCM is grateful to the members of the working party who provided assistance in developing the mandate and identifying issues that would be explored by this Advisory Council. Three new members for the Council will be sought in the coming months by the Bishops’ Commission. The first meeting will be held on the 16th of February at Mary MacKillop Place in North Sydney.